We’ve been enjoying some very good jazz and blues nights over the last month. 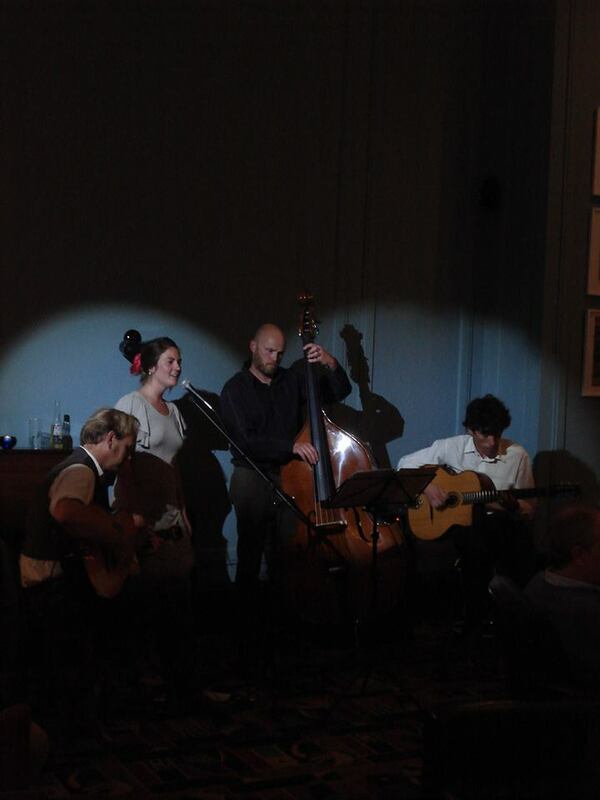 Jazz from Jim Thorn & friends, gypsy jazz from Cat Skellington and blues from Yank Heartsrings and Beeno. All have been great and suited the setting of the club well. July sees more of the above as well as some new jazz from the Alan Nichols Trio, blues from the Oregon blues traveller Kory Quinn and others to be announced. Keep an eye on our coming up pages and join us for a relaxed evening of jazz and blues. We are very happy to say that Jim Thorn will be the nucleus of a regular, fortnightly jazz night at the club – usually Fridays but keep an eye on our ‘coming up page’ or Twitter feed @ventnorartsclub. We have really enjoyed the gigs so far and look forward to many more – Jim on his own, sometimes with Jon Thorne on Bass, Loren on vocals and others who will sit in when they are in town. If you require a lush, comfortably furnished private space in which to hold a cocktail party, reception,screening, presentation or private dining event we offer an elegant environment in the heart of Ventnor. Our manager and chef will work with you to ensure that you and your guests are well catered for and service is attentive but unobtrusive. It’s weekends like the one we just had make us wish that we could use the roof and our courtyard. Well, we can I suppose, but we can’t allow public use. We are often asked why we don’t open the roof as part of the club but it is not as suitable as it may appear from the road. It would need a great deal of work, in its current form could be unsafe and in fact, the views are not great. We are also asked a lot why we don’t utilise the courtyard as a smoking area to prevent people having to stand on the high street. Unfortunately, although it was always our intention and the preference of the police officer when he inspected, it is against our current planning permission. But a very nice summer staff room it will be…very soon. Next weekend we take a break from enjoying musical performances to take part in the Isle of Arts weekend. There are four events at the club from Friday to Sunday including talks, films and a mixture of both. For more information and details of where to purchase tickets for the events that we are hosting and others around Ventnor, click here. Dan was moving swiftly between the coffee machine and his spirit bottles on Saturday to keep up with the demand for Espresso Martinis. Having spent Friday evening trying out several new cocktails in preparation for a specials list next weekend, market forces voted the coffee, vodka, Kahlua based cocktail the clear winner on that night. However, there are others that will be contenders when they leave the shaker, sweet, sour and some confusing the senses next week. 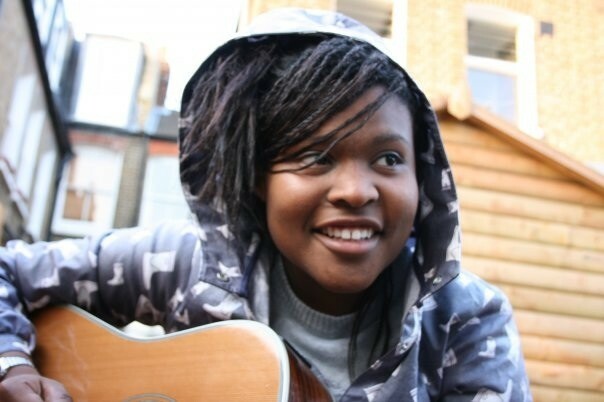 We were treated to a visit by Sherika in March and she charmed us with her soulful songs, interstitial chatter and loveliness. Here is what she had to say about her trip…we hope to see her again soon. I had the pleasure of playing at the Ventnor Arts Club on the 15th of March. Travelling from London, it was my first time visiting the island; the journey was surprisingly very easy! A straight train from Waterloo to Portsmouth harbour and a twenty-minute ferry journey, I was greeted by the fresh air of Ryde and miniature looking tube train where people seem to talk to each other :s reminding myself I wasn’t in the military confinement of London anymore and had in fact gone back in time where a lady knits on a train instead of repeatedly refreshing Facebook (me), I slowly but surely engaged in conversation. After driving through the swerved hilly clean lanes from Shanklin to Bonchurch, we arrived in the beautiful setting of Bonchurch Inn. Our hosts were very welcoming and hospitable, I sadly didn’t have enough time to sit and properly enjoy a beverage in their charmingly small warm pub but I will definitely make sure I stop by when I next visit the island. The Ventnor Arts club is a beautiful elegant venue placed perfectly in the small town of Ventnor. I can confidently say it is now one of my favourite venues. After being blown down the hill to find out that the fish and chips on the shore was closed, we settled with a tapas restaurant a few doors down from the venue, the food and service were amazing. Worried I had given all my energy to the chorizo cooked in cider and garlic prawns, I became nervous when starting my set, but the audience were just amazing! They charged me like a battery. They were so loving and welcoming; their energy really lit up the venue! And I felt that all my lyrics were being processed and given back to me with more positive energy. I would absolutely love to return and play for the Ventnor Arts Club again it has definitely become a memorable part of my journey as a musician. Thank you so much Stephen, the bar staff and audience of Ventnor Arts Club! It was an absolute pleasure performing for you! We are pleased to say that we are hosting events for the Isle of Arts. The schedule includes talks and films over the long weekend and we look forward to some interesting and stimulating sessions. One of the aims of the club is to help creative people and projects in the area complete interesting projects. We are putting together a panel of members and associates who, during their careers in media and the arts, have learned lessons along the way and managed to achieve what they set out to do. Or at least a variant of it – few things end up exactly as they were envisaged. The plan is still forming, but in principle, we will invite people who have a creative project already underway to come along and talk to a member, or members of our panel who can give advice, encouragement and generally help to nudge a project forward with the benefit of their experience. It’s not a pitch process, it’s a sort of creative clinic. You may well be talking to an accomplished artist, a seasoned film producer or a recorded musician but it’s not intended to be an opportunity to sell in a project. Sometimes the advice is all it takes for a project to get moving again. More details later.